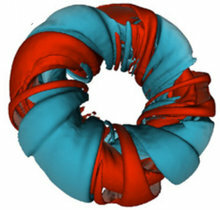 The influence of the curvature of the imposed magnetic field on reversed field pinch dynamics is investigated by comparing the flow of a magnetofluid in a torus with aspect ratio 1.83, with the flow in a periodic cylinder. It is found that an axisymmetric toroidal mode is always present in the toroidal, but absent in the cylindrical configuration. In particular, in contrast to the cylinder, the toroidal case presents a double poloidal recirculation cell with a shear localized at the plasma edge. Quasi-single-helicity states are found to be more persistent in toroidal than in periodic cylinder geometry.